Francophiles take note. 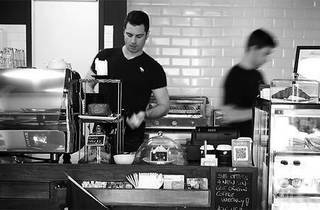 There is a little, French themed café – though they stop short of berets - in the heart of Darlinghurst. Set neatly in between the chaos of both Oxford and William Streets, Sur Bouke Espresso Bar is in a surprisingly quiet spot. There are some sunny seats outside, and inside you can choose between a jaunty, rainbow-striped canvas banquette and a big communal table lacquered with old Tin Tin comics (in French, of course). Jugs of flowers adorn the tables, lovely tea towels are displayed on a rack behind the door and there are fixies hanging from the celling that can be yours if you have a few hundred dollars to spare. 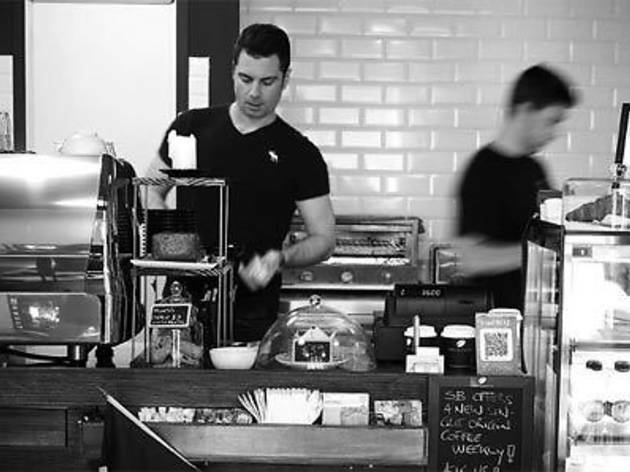 The coffee is Toby’s Estate, there are colourful macarons for a sweet treat, and the menu boasts French additions like a croque monsieur – the most elegant of all the ham and cheese toasties. The salade au chevre chaud gets a lot of things right. The bite of the goats cheese is tempered with a sweet drizzle of honey over the top and the toast to cheese ration is spot on. It's less a single meal and more like two very separate snacks - cheese on toast alongside an overdressed salad. If you're stinging for a French meal we think that you might have more luck with the assiette de campagne – the Frenchy’s answer to A ploughman’s lunch. The poached chicken salad suffered from a similar excess of dressing – next time we'd go for the poached chicken, mayo, walnut and greens in sandwich form instead. Sur Bouke makes for a pleasant coffee spot if you are ambling about in Surry Hills and Darlo and is surprisingly hipster-free in spite of the bicycles on the walls.